Augustus Ernest Pitcher (generally known as Ernest) was born on 14th April 1877. In 1901 Ernest was living with his parents Walter William and Anna Maria Pitcher in number 24 Gloucester Road. He was working as a house decorator. We understand that Ernest was a decorator and sign writer for the family firm until an accident which lead to blood poisoning and prevented him from working. He married Annie Symes on 13th February 1908 in the Thornbury Independent Chapel. Annie was born on 7th December 1878 and was the daughter of Bernard and Laura Symes. (Note: Ernest’s brother, Charles Arthur also married an Annie Symes, this one, the daughter of Charles Symes who ran the ironmonger’s business on The Plain. The Annie’s were first cousins.) Ernest and Annie had one son, Douglas Walter Bernard, who was born on 11th June 1910. The Prewitt’s Directories from 1909 to 1912 and the 1910 and 1913 electoral registers show that AE Pitcher was resident in Gloucester Road, but these sources do not identify which house they were living in. We heard from the current owner of 8 Gloucester Road, Joan Hall, that as Town Mayor she had presented Annie Pitcher with flowers on her 100th birthday. Annie told Joan that she began her married life in Joan’s house. This is confirmed by the fact that the rate book of 1910 shows that the houses was occupied by A E Pitcher and owned by the Representatives of the late George Hodges. They were also listed as living there in the 1911 census which shows Ernest as a painter and decorator. Also living with them were Elizabeth Putley, an unmarried aunt aged 67 born in Alveston and living on ‘Private Means’ and a female domestic servant, Laura Wolsley aged 15 from Morton. By 1914 these Pitchers were definitely in the High Street as they are listed there in the 1914, 1915 and 1916 Prewett’s Street Directories and the 1918 Electoral Register. They lived in a house now known as 4 High Street. We have been told that Ernest was unable to work after his accident so his resourceful wife found another way of earning money. Annie ran the sweet shop at 3 High Street directly opposite their house (currently trading as Gems, jewellers). Annie sold ice cream home-made in a tub. We have heard stories that after the war years ice cream was a rare delicacy in Thornbury and there were queues outside the shop on Fridays when the fresh batch was due. We understand that although Ernest is listed as a confectioner in the High Street in 1926, 1927 and 1931, it was Annie who ran the business. There was an article in the Gazette newspaper at the time of Annie’s 100th birthday. In it she explains that she ran the shop in the High Street for “about 50 years”, until her 88th year. Annie Pitcher, the wife of Augustus Ernest, bought the house at 3 Castle Street on 26th May 1937. It seems unusual that Annie should buy the house rather than her husband and we cannot explain this. It will be noted however that Annie ran the sweet shop rather than her husband and we have been told this was because Ernest was in poor health after his accident. Ernest continued to live at 3 Castle Street until he died on 1st June 1957 aged 79 years. The electoral register of 1975 shows that another lady, Gladys Gibbins came to live with Annie Pitcher. We know from other evidence that she acted as companion to Annie Pitcher. 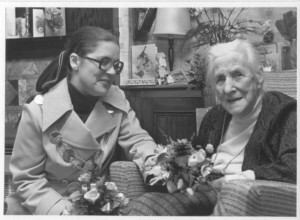 Annie was still in the house when she became 100 years old in 1976. We have a wonderful photo above which shows Joan Hall as mayor of Thornbury presenting Annie with some flowers on her 100th birthday. It was taken in the Castle Street house. Annie died on 6th January 1977. Here on the left we have a thumbnail image of the wedding of Ernest and Annie Pitcher in 1908. This shows many members of the Pitcher clan with the names s we have been told them. Please click on the image for a larger version.